Bay Area residents are undeniably blessed with a relative abundance of interesting ways to spend their free time; we serve as an art hub, have beautiful nature all around us, and boast a bustling bar/restaurant scene. When you add another Bay Area staple, cannabis, into the mix, each individual user is likely to have his or her own views on what kind of activity is most appropriate to spend their valued ‘high’ on. Mission Peak: Located in Fremont, and probably the South Bay’s most popular hike. It’s a 6.2-mile trail from start to finish with an elevation gain of nearly 2,000 feet. Inexperienced hikers should set 4-5 hours aside to complete this course. It’s dog-friendly as well, which is always a plus! Mount Davidson Park: One of San Francisco’s favorite parks, Mount Davidson is what we’d call a casual hike, with an fantastic payoff of a one-of-a-kind view of SF. Near the peak, you’ll find the famous 103-foot-tall cross, which has become somewhat of a minor landmark for The City. Easy to fit in if you have a busy schedule -- usually a 20-40 minute walk, round-trip. Steep Ravine Trail: Right next to Muir Woods in Mill Valley, technically included in Mt. Tamalpais State Park, is Steep Ravine Trail. One of the most unique trails we’ve experienced, most hikers start at the top to begin, and descend the trail down to Stinson Beach. Encountering scenic wooden bridges and even a ladder or two along the way, this trail is sure to keep you on your toes. Seeing Things Gallery: Based in San Jose, Seeing Things is an art gallery that displays all types of art, with an emphasis on South Bay artists. This cozy space hosts monthly art shows and stocks a plethora of DIY-style magazine and books that are regularly available at their location. Definitely recommended for those into edgier work and/or just want to get a grasp on the South Bay art scene. SFMOMA: The granddaddy of art museums in the Bay Area, SFMOMA has the name recognition to excite even those that are lukewarm art fans. The amazing interior architecture is enough to marvel at by itself, and will keep your non-art-appreciative friends occupied, while you enjoy the surprisingly thorough and interesting exhibits throughout the building. Exhibitions generally run for months at a time, giving you plenty of time to make your way over and check out a show. Bring your wallet with you to this one though -- entry is $25 for adults. 111 Minna: A galley space doubling as a bar and gathering area, 111 Minna usually offers some great work from local photographers, painters, and more, while also providing a classy day or night out in San Francisco’s SoMa district. The only issue with this is that sometimes the drinking and partying can take precedence over the artwork being shown -- great for many occasions, but maybe not for those seeking a place to quietly reflect on the work being shown. West Wind Capitol 6 Drive-In: Located in South San Jose, the Drive-In has long been a favorite for cinema fans of all ages -- just drive your car through the gates, tune your radio, and that’s it -- you’re ready! Additionally the ability to bring food/drink, your pet, and your Elemental Wellness products to the theatre, put this gem at the top of our list. AMC Metreon: Aided by prime location in downtown San Francisco, the Metreon 16 still provides one of the best IMAX experiences around and is always packed for blockbuster sci-fi releases and more as late as midnight. Outside of IMAX, the Metreon hosts several quality viewing rooms and a great movie experience -- hop right into the downtown SF bar/restaurant scene after the movie to take advantage of the great location. The Roxie: Sitting in the heart of the Mission District, The Roxie may appeal to many of our hipster readers, favoring obscure and cult movies over blockbuster hits. For instance, its current show is a revealing documentary on the teenage years of Jean-Michel Basquiat. A favorite among San Francisco locals, and operating since 1909, The Roxie also holds the claim as the oldest continuously operating movie theatre in the United States. Amoeba Music: Possibly the most popular destination listed, it’s hard to make it through San Francisco’s Haight District without seeing multiple people rocking Amoeba shirts along the way. Serving as an all-the-time massive record store, and a some-of-the-time concert venue, Amoeba is built on ideals that mirror San Francisco’s and its long, lucrative stay next to Golden Gate Park is a reflection of the acceptance it’s gained from locals and tourists alike. It’s always great here, but definitely a you-gotta-go-at-least-once type of joint. Cafe Stritch: The busiest live music venue in San Jose’s SoFA district, Cafe Stritch offers live music at great prices almost every day of the week in a classy, dim-lit environment, perfect for a night out with your special somebody. Specializing in jazz, but also occasionally offering rock, blues, and more, it’s hard to have a bad time at this establishment. It’s proximity to other points of interest make it a great stop if you’re bar-hopping as well. The Greek Theatre: A comfortable outdoor venue located on the campus of UC Berkeley, The Greek Theatre offers a unique theme, as well as unmatched views of the Bay, for those sitting or standing in the upper ‘grassy hill’ area. Seating 8,500 plus, The Greek Theatre attracts some major acts to Berkeley -- just beware, that with the usually primarily-college-aged crowd, things can sometimes get a bit rowdy. 1. Dolores Park: Guaranteed to be packed on almost any sunny day (weekday or weekend), Dolores Park is a San Francisco staple, that has been attracting swarms of sunseekers for decades, with its ideal weather, energizing atmosphere, and breathtaking views. Fantastic for people-watching as well, expect to see hula-hoopers, bubble-blowers, circus acts, and more all in the same place at the same time. If that sounds like too much for you, there are always open spaces to get away from the noise and enjoy a pleasant nap. 2. Santa Cruz Boardwalk: Offering more of a Southern California beach vibe than the rocky coast line we’ve come to know throughout most of NorCal, the SC Boardwalk offers amusement park rides, tons of open beach space, and great food and drink -- all just one hour south of San Jose. Kid-friendly as well, the Boardwalk is the perfect day tip to help you and the family temporarily escape the monotony of everyday life. Also keep an eye out for their Free Concert Series -- it starts June 15th this year. 3. Alamo Square: Another SF gem, you may know Alamo Square from its Victorian-style houses shown in the opening of Full House, but you’ll stay for the warm sunlight, great location, and great vibes. Sitting between Hayes Valley and the Fillmore District, this one is an easy walk if you’re around SF City Hall. Always tons of dogs around as well -- feel free to bring yours! 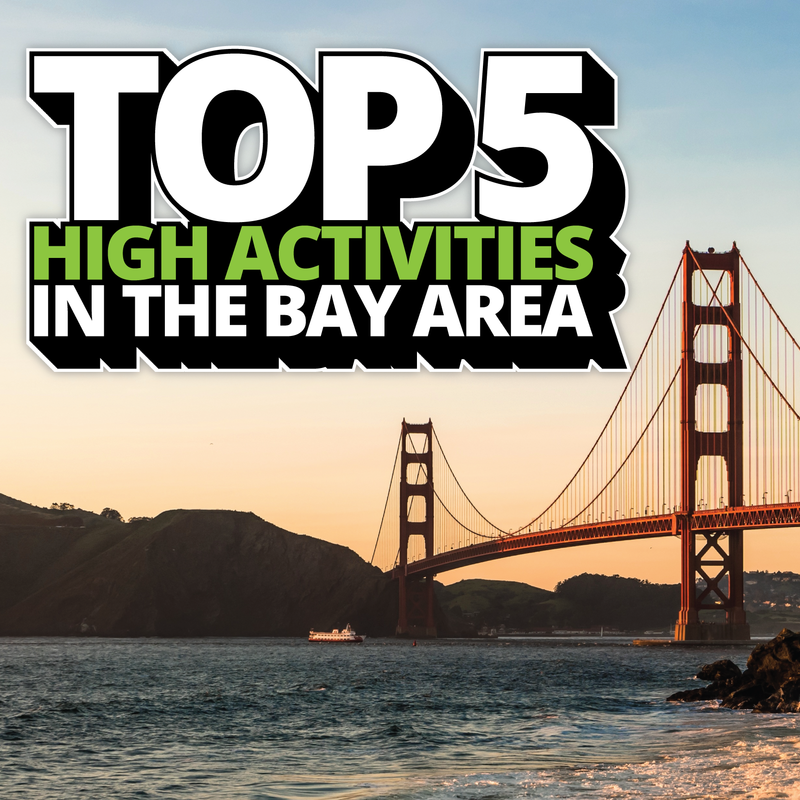 Any activities and/or locations in the Bay Area that we missed, or you feel should have been included? Let us know on our Facebook, Twitter, and/or Instagram -- hope to see you in soon!